Costa Rica was the first country we visited when we started our programme to Latin America in 1995. In fact we were the first to feature Costa Rica as an independent fly-drive destination and many of our travellers still explore this pocket-book sized country in a hire car, allowing us to plan and pre-book their route. We appreciate others prefer to let someone else do the driving so we have developed a range of itineraries, based on private transfers and internal flights. The ‘Classic Costa Rica’ itinerary is our most popular, represents excellent value for money and allows for four nights beachfront relaxation at the end. It’s what Costa Rica packs into 19,700 square miles (approximately the size of Denmark) which is astounding. This tiny country of inland canals, rainforest, cloud forest, volcanoes and beaches harbours stunning flora, including 8,000 species of orchid and an amazing selection of wildlife including turtles, macaws, caiman, basilisks, monkeys, armadillos and sloths. 25% of the country is designated as national park or protected area. Costa Rica also boasts 78 rivers, of which the Pacuare is a river rafter’s dream. Arrival at San Jose international airport. On arrival, private transfer (approximately 40 minutes) to the 3 star, owner managed, Bougainvillea Hotel for one night on a bed and breakfast basis. The hotel is in a quiet residential area of the capital (15 minutes by taxi from the centre) and set in 10 acres of superb mature botanical gardens. Views are to the mountains which surround San Jose or to the capital’s skyline. The Bougainvillea boasts a restaurant, bar, pool and tennis court. Overnight at Bougainvillea Hotel in San Jose. After breakfast, a group transfer (depart around 0600) north to Guapiles (breakfast stop) in the heart of Costa Rica’s banana growing region in the Limon district and the gateway between the Caribbean coast and the central highlands. From Guapiles, the transfer is by boat through exciting mangroves to the Mawamba Lodge in Tortuguero National Park for 2 nights on a full board basis. Arrive in Tortuguero around 1300. 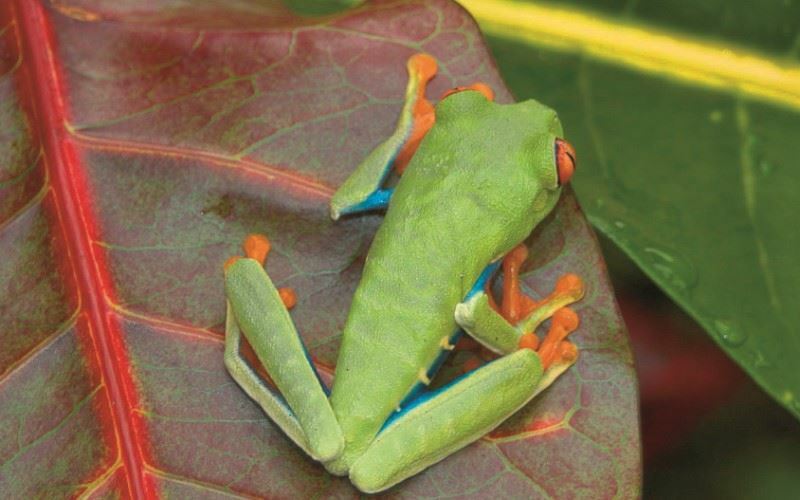 We have featured the Mawamba Lodge since we started our Costa Rica programme. This is a rustic lodge located between the canals and the sea with 58 wooden cabins - all with private facilities. Don't expect air conditioning, TV or WiFi here. There is, however, a swimming pool, jacuzzi. restaurant and bar. There is also a frog garden and butterfly sanctuary on site. It is a short walk to the tiny village of Tortuguero and to Tortuguero beach where, on moonlit nights in July and August, you can watch the Green Turtles labour their way up the beach in their hundreds in order to lay their eggs - a memorable experience. Overnight at Mawamba Lodge in Tortuguero National Park. After breakfast depart for a group guided wildlife canal boat trip and guided walk. Tortuguero (‘turtle place’ to the indigenous population) National Park was once an archipelago of volcanic islands so the distinction between sea and dry land is blurred. Lagoons, wetlands, beaches and canals abound and the park is best explored by boat. Fifty species of fish live in the canals as well as spectacled caiman and southern river otters. Spider and howler monkeys dominate the trees. After breakfast a boat and land transfer (approximately 4 hours 30 minutes) to Arenal and the Arenal Manoa Resort (junior suite with volcano view) for 2 nights on a bed and breakfast basis. To see the perfect cone of the Arenal volcano rising from the surrounding tropical rainforest and lake below is a special experience. Howler monkeys, macaws and brilliant butterflies flourish among the heliconias and cascading waterfalls. The Arenal Manoa, set in lush gardens, has a unique setting giving incredible views of the volcano. All rooms have a panoramic vista of the mountain. The rooms are bright and modern, set in bungalow-style buildings. The hotel has a swimming pool, restaurant, bar and Jacuzzi. You need to make the most of your time at this incredible location. In the evening, go to the nearby Ecotermales hot springs to swim, relax and have dinner. Not only is this a wonderful experience but the view of the volcano, is one of lifetime’s unique memories. Our chairman Noel ranks his visit to Ecotermales in 1994 as the most memorable aspect of his research trip to Costa Rica. Overnight at Arenal Manoa Resort (junior suite with volcano view) in Arenal. The private half day guided tour of the Arenal Hanging Bridges is yet another highlight to be remembered. The forest canopy is a world apart from what we are used to seeing in tropical rainforests and these suspension bridges (6 in total) which span the forest canopy, make it possible to view exceptionally beautiful plants and animals (for instance sloths and howler monkeys) which live in the canopy. Here you are often 50 metres above the ground. Taking full advantage of the unique habitat there are many activities in and around Arenal from white water rafting to zip wire rides which can be booked locally. After breakfast, private transfer (approximately 4 hours) including a lake crossing from Arenal to Monteverde to stay in the Trapp Family Lodge for 3 nights on a bed and breakfast basis in a mountain suite. The Trapp Family Lodge is the closest hotel to the Monteverde tropical cloud forest reserve which is a 15 minute walk away. This rustic lodge has 20 spacious rooms with cable TV and private facilities. Hardwood floors and bright local artworks complete the picture. Large windows look out onto the gardens and the cloud forest beyond. There is a bar, a lounge where one can relax and read and a restaurant which serves home cooked meals. Overnight at Trapp Family lodge (mountain suite) in Monteverde. At 1400 metres above sea level the Monteverde cloud forest is swept by mists heavily laden with moisture which nourishes the unique environment where a multitude of species flourish. Founded by American Quakers in the 1950’s - The Cloud Forest Reserve was established in 1972 and now covers 35,089 acres. The forest harbours the greatest number (420) of orchids in one place in the world… There are six ecological zones, 90% of which are virgin forest. The biodiversity is enormous, with 2,500 plant species, 100 species of mammals, 400 bird species and 120 reptilian and amphibian species. You might even catch a glimpse of divinity in the form of the resplendent Quetzal. After breakfast there is a private half day guided tour to the reserve and in the afternoon you are free to explore further or book one of the many activities that are available in the area. A day at leisure to relax or explore the area further. Here you will find some of the best zip wires in Costa Rica, canopy tours, suspension bridge walks, hiking trails and horseback tours. There is also an opportunity to visit a local plantation to discover how coffee is made. The private transfer from Monteverde to the southern part of the Nicoya Peninsula will take approximately 5 hours (including a lovely ferry crossing). Your stay here will be for four nights at the Tango Mar hotel in a beachfront room on a bed and breakfast basis. The Tango Mar is located at Playa Quizales, the furthest point south on the peninsula and 3 km south of the town of Tambor and a 40 minute drive from the ferry terminal. Tourism has transformed the original fishing village into a small town with a local airport and a variety of restaurants, cafes and bars. The Tango Mar is an ideal spot to relax and enjoy the final few days of your stay. This is an attractive, romantic beachfront resort. There is a swimming pool, nine-hole par three golf course, two tennis courts and stables for those interested in horse riding. It is possible to walk from the hotel all along the beach to the village of Montezuma (approximately 2 hours one way). Please note the tide can be strong in the area so please check before swimming. The rooms are all air conditioned, have ceiling fans, satellite TV, minibar and safe deposit box. Tropical gardens and palm trees surround the property. Overnight at Tango Mar (beachfront room) in Nicoya Peninsula. The area has much to offer and activities can all be booked locally. The Nicoya Peninsula on Costa Rica’s Pacific coast is 80 miles long and is known for its magnificent beaches and long dry season. Water sports and wellness are popular activities here. There are many hidden beaches to explore. Kayaking, boating and surfing are all activities to be sampled. The privately owned Curu reserve fringed with white sand beaches protects a wide variety of flora and fauna. The Cabo Blanco reserve occupies the entire southwest tip of the peninsula. With a four-wheel drive in the dry season (can be impassable in the rainy season) it is possible to extend your itinerary and head further north to Playa Bejuco and Nosara. The Ostional coastline is the world’s largest nesting ground for the Olive Ridley turtle between July and December. Or alternatively - just relax! After breakfast you will have a private transfer to San Jose airport (approximately 5 hours including a ferry crossing) for your return flight back to the UK. Surrounded by extensive mature gardens and a short drive away from the hustle and bustle of downtown San Jose, Bougainvillea Hotel is an oasis of calm and a comfortable base from which to explore the city. The hotel offers a large outdoor pool, tennis courts and fitness centre. In addition, guests can enjoy local and international cuisine in the Vitrales restaurant and bar. The spacious rooms have private facilities and feature balconies overlooking the gardens or city, flat-screen TV, safety deposit box, coffee maker and complimentary Wi-Fi. This lodge has 58 simple cabins, all with private facilities (shower) including four honeymoon suites. Just a short drive from Arenal Volcano National Park, Arenal Manoa is an ideal base from which to explore this fascinating region. Just a short drive from Arenal Volcano National Park, Arenal Manoa is an ideal base from which to explore this fascinating region. The spacious air-conditioned junior suites provide modern, comfortable furnishings and feature two queen sized beds, private bathrooms, refrigerator, direct dial telephone, safety deposit box and coffee maker. Surrounded by mature gardens, the rooms have a small private terrace with table and chairs providing a panoramic view of the volcano. The hotels’ La Saca Restaurant offers regional and international cuisine with the same amazing views of the volcano. There are two swimming pools, a spa and a farm where guests can interact with the animals. The Trapp Family Lodge is the closest lodge to the Monteverde Reserve (a fifteen minute hike), ideal for bird watching and families or anyone appreciative of a warm, homely atmosphere. The Trapp Family Lodge is the closest lodge to the Monteverde Reserve (a fifteen minute hike), ideal for bird watching and families or anyone appreciative of a warm, homely atmosphere. The 20 rooms are spacious and each with private bathroom and balcony with views to the cloud forest. The new mountain suites also include TV, minibar and bathtub. As in all lodges in Monteverde, due to the altitude, the rooms do get chilly in the evenings, but the hotel provides thick blankets to keep you warm at night. The family-style restaurant serves tasty, typical Costa Rican cuisine and its large windows and balcony allow diners to enjoy an outlook over the gardens and verdant rainforest. This lodge benefits from being one of the smaller properties in Monteverde. Tango Mar is located 3km south of Tambor village, a 40 minute drive from the ferry terminal. This is an attractive, romantic and remote beachfront resort. The extensive facilities include a swimming pool, nine-hole golf course, two floodlit tennis courts and stables. It has a variety of beachfront rooms, different suites and large villas with air-conditioning, fans, satellite TV, mini-bar, safe deposit box, large showers and picture window balconies. Some rooms do not have an ocean view. Lovely spot and great value.